There are so many really wonderful things we can say about Chesapeake Bay fishing that one page can hardly do the Bay justice. From northern Maryland in the Baltimore Washington region all the way south to Virginia Beach the Chesapeake Bay is just teeming with marine life and natural resources that attract anglers and visitors from all around the globe. The Chesapeake Bay is the outdoor sportsman’s play ground of the Mid-Atlantic coast. Local sportsmen and women too enjoy everything from pleasure boating to crabbing to sportfishing. The Maryland Chesapeake Bay is famously known for it’s striper fishing, or rockfishing as most Chesapeake Bay charter boat Captains call it. Chesapeake Bay striper fishing is currently the most popular and plentiful recreational fishery. The seasons are limited to certain months of the year but when the striper season opens, usually on the 3rd Saturday in April, you will find that striper fishing or talk of striper fishing in the Chesapeake Bay is what has most anglers attention. Chesapeake Bay striper fishing didn’t always get this much attention. 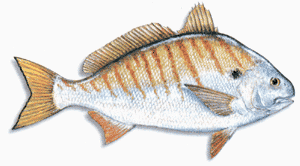 Twenty or so years ago the Chesapeake Bay rockfish were nearly gone, almost non existent. The heavy recreational and commercial fishing in the 1970’s pushed the striper population to the brink and they became the talk of what used to be. But through government fisheries and other conservation entities the striper were re-introduced into the Chesapeake Bay. Most of these striper of the late 1980’s were bred on fish farms and which point they were put into the Bay. Heavy restrictions were placed of striper fishing in the Chesapeake Bay so the fish could easily grow and flourish. The Chesapeake Bay striper program was a great success and led to what is now the best striper fishing on the entire East Coast. There is even what is called a trophy season which allows anglers to keep very large rockfish, which can run over 40 pounds or more. Trophy Striper fishing – a.k.a. 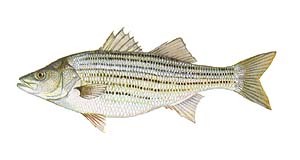 Big Rockfish or Striped Bass – The Fisheries Commission regulates the trophy striper season. The seaon for trophy striper aka rockfish usually begins in middle April each year and runs until middly May of each year. Check with us or your Captain for exact opening dates each year and catch limits. There is also a fall season in Oct and Nov. Recreational Fishing Regulations. Rockfishing – Regular Season from mid May to mid December.Spot, and White Perch – Probably the most popular type of fishing in the Bay for kids or anglers looking to catch a nice mess of fish for the dinner table. 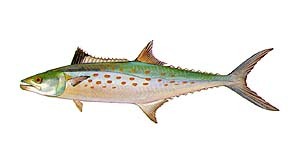 Spanish mackerel and Bluefish – Just one of many species that can be caught while trolling for stripers. 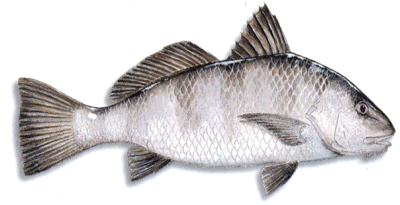 Black Drum, Red Drum – Among other species that are often caught in the Chesapeake Bay.